← The only stronger law is that you must say “lifeblood” when you discuss CA water. I drove up the 5 on Sunday. 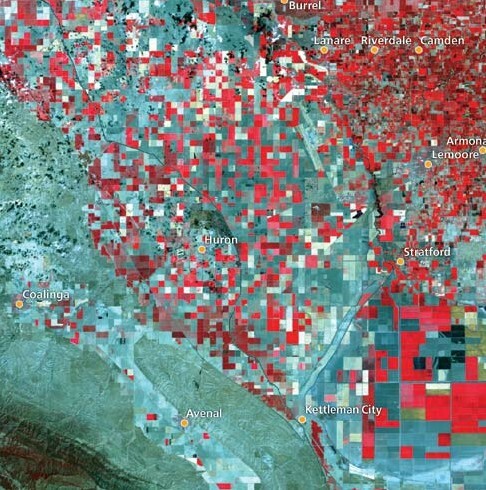 I knew that almond acreage had expanded since the 2006-2009 drought. I knew that almond acreage went from 825,000 acres of almonds in 2010 to 940,000 acres in 2014. But it was still striking to see all those new trees. I thought some things. a. I heard a completely unsubstantiated rumor that during the 2006-2009 drought, growers in Westlands deliberately didn’t plant acreage close to the 5 and even harrowed that soil so that it created more of a dust storm. 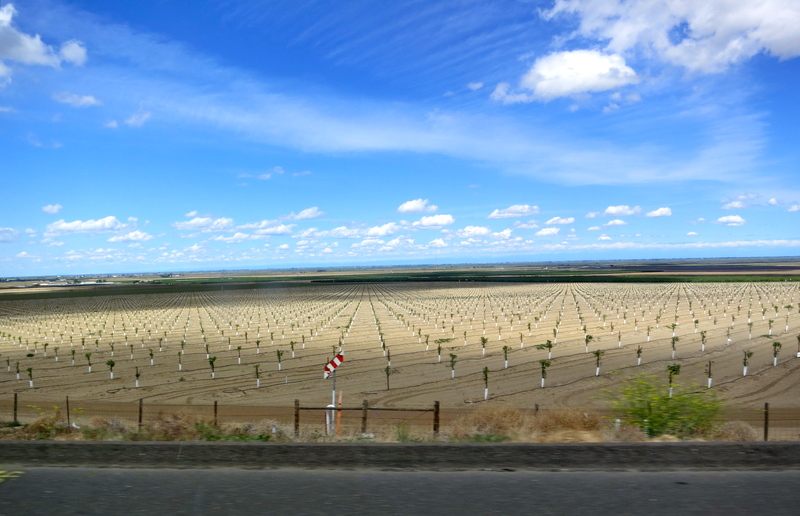 I couldn’t support that rumor one bit, but I did muse that planting almonds all the way up to the freeway would make similar image management more difficult in this drought. II. Westlands made a big fuss about all the acreage it fallowed in the 2006-2009 drought. 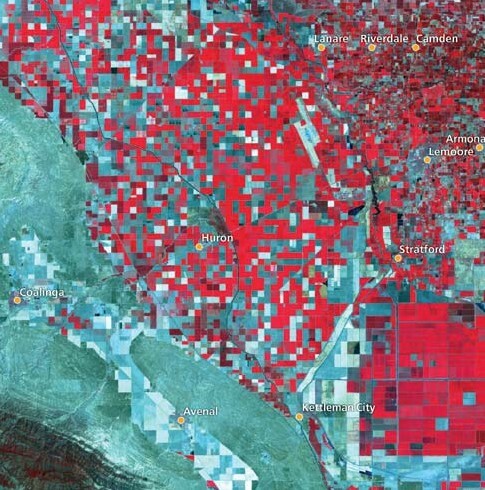 This comparison of irrigated acreage was a big deal at the time. These new planting of almonds mean that some time in between 2010, the first wet year after the drought and 2012, our last wet year before this drought, the farmers in Westlands thought to themselves: Boy howdy, people sure are getting some nice prices on almonds. I want some of that so bad that I will invest nearly $1M/acre in capital in almonds, backed by my surety of getting water every single year for the next twenty to thirty years. Surely drought like the one that happened two years ago could never happen again, despite widespread predictions that climate change will bring about a more variable climate. Why, what could predictions mean to me, here in our second wet year in a row since a three year drought that caused substantial fallowing in this exact location? 3. Here is an article about rising food prices due to drought. American consumers are already feeling the pinch of rising food prices, and they will likely experience more—courtesy of California’s devastating drought. “I would expect a 28 percent increase for avocados and 34 percent for lettuce,” said Timothy Richards, a professor of agribusiness at Arizona State University who conducted research released this week on probable crop price increases stemming from the ongoing drought. In a phone call with CNBC.com, Richards added that the price increases would also include foods including berries, broccoli, grapes, melons, tomatoes, peppers and packaged salads. The higher rises should be felt in the next two to three months, he said. Those prices are rising because growers are fallowing their row crops to protect their trees. I understand that in any single year of drought, given that they have invested so much in their orchards, they must do that. But, since growing row crops for American consumption only happens on perhaps a third to forty percent of Californian irrigated acreage, there is no need for this. If it were the first priority of Californian growers to hold American vegetable prices steady, they could grow all the produce they ever do, even in this drought. These increased food prices are a result of Californian growers choosing to gamble for high nut profits from China. People who believe in markets believe this is fine. Allowing Californian farmers to trade Californian rivers, fish and aquifers and American produce prices for higher monetary profits is generally thought of as underpinning a strong agricultural economy, which is thought of as inherently good. Fine. If that is the thinking, then farmers and growers are behaving like reasonable market actors. But they cannot have it both ways. They cannot be hardheaded market actors and also our noble sources of food that should be supported by drought emergency measures. They cannot be our food producing buddies that we take care of during droughts AND people who are intentionally shafting us by fallowing produce acres so they can maximize almond profits in a couple more years (which must always be wet years). If they are hardheaded market maximizers, let them fall from their gambling on climate reliability and their political strength. Yes, they are playing chicken, but you will not get very far with the “feed us, not them” ideal. Under most conditions (and the pursuit of social welfare), there will be food that goes to locals as well as food that’s exported. Go ahead and call their bluff (they bluff all the time), but don’t call for locals only production. The last thing we want are shoes “Made in Westlands”! What we want is for the rhetoric to match reality. If food security and prices are a major part of the argument the CFWC makes, then it is entirely fair to ask them when almonds became staples of American dinners. I also want people to evaluate what we’re willing to sacrifice in this drought against profit-driven gambling on supplying the world’s almonds, not basic foods for Californians. Thank god there are still some sane people left. I thank you and do the people of the future. 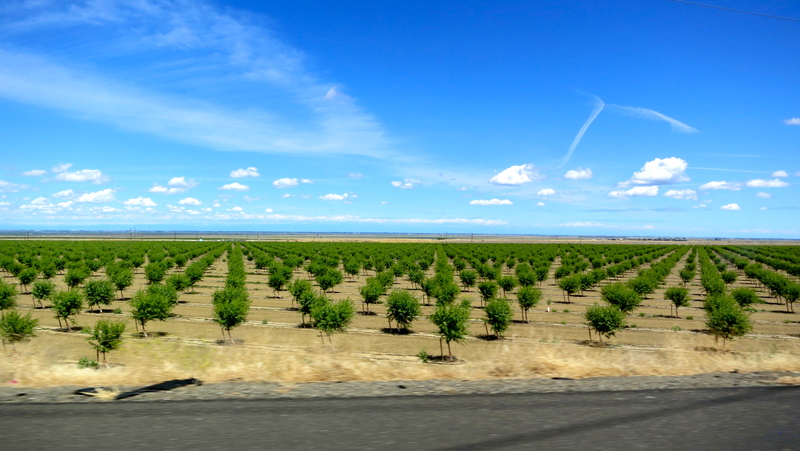 Grapevines are to Paso Robles as almonds/pistachios are to the Central Valley. I drove up the 46 from Central Valley to the 101 at Paso Robles and up. 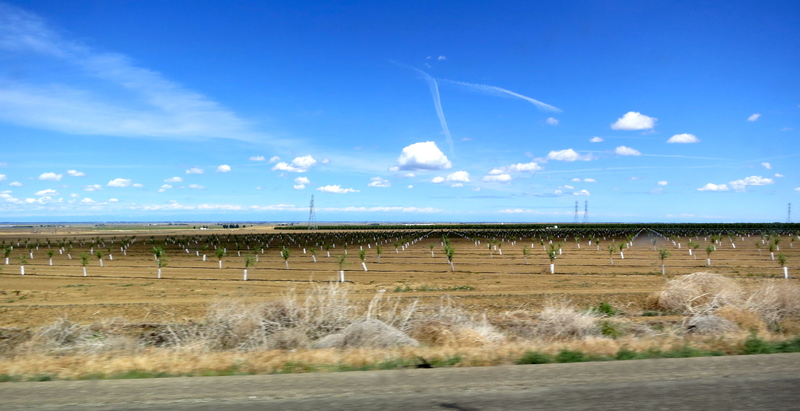 Driving west on the 46, you drive through corporate ag country – almonds and pistachios being grown with SWP water in a very remote part of the valley where no one lives. Then you cross the mountain range and the grapevines begin. Grapevines as far as the eye can see around Paso Robles. It continues as you drive north up the 101. There is one spot where it’s rolling hills off into the distance, all covered with grapevines. 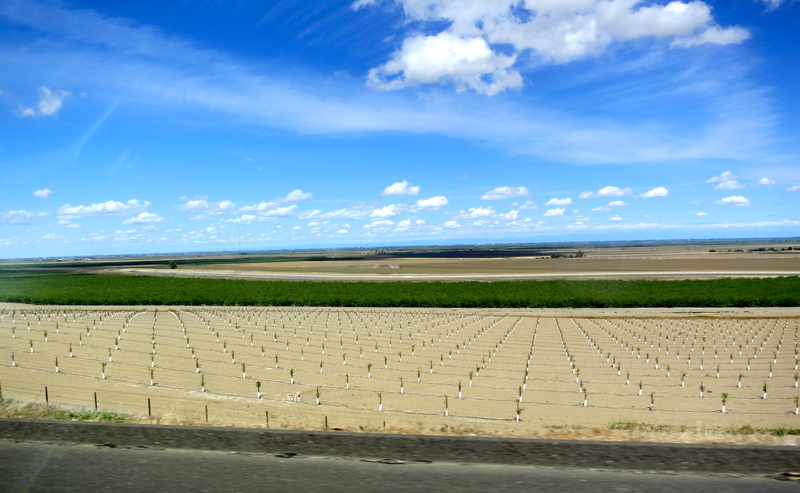 Every square inch they could put in grapevines, they did, on both sides of the freeway. I have no issue with what we export or to whom, but, as John Bass pointed out their sales pitch needs to match the reality we are living with. At what point should the owners of Public Trust water have a say in what is “reasonable and beneficial” as relates to crop choices ?